If you are wanting extra security for your business, then roller shutters are the way forward. They are a cost-effective solution that will see your building kept safe. They act as a deterrent against would-be thieves, and are strong and durable enough to withstand the Australian climate, and can also offer a sense of privacy by obstructing the view inside. Roller Shutters – If you want a great way of protecting your business, then roller shutters for the building is ideal. They will not only act as a durable barrier to keep out intruders, but their presence also helps deter vandalism and theft. Roller shutters are a very cost-effective security solution. Industrial Roller Doors – Get an easy to operate, heavy duty industrial roller door to suit your building’s needs. Great for warehouses and large garages, they can be motorised for convenient opening and closing, or chain operated. Roller Shutter Motors – Industrial doors need powerful motors to operate them. We specialise in Grifco products, a brand known for their reliability, especially with industrial and commercial doors. Commercial Roller Doors – Perfect for small garages, carparks, and warehouses, a commercial roller door will keep your building secured after hours. Combine them with a motor for easy access using a remote or digital code. Colorbond Roller Doors – Don’t stick with dull colours that don’t match your brand. Thanks to Colorbond, roller doors can come in a variety of shades that go best with your company’s colours, ideal for buildings that are meant to stand out. 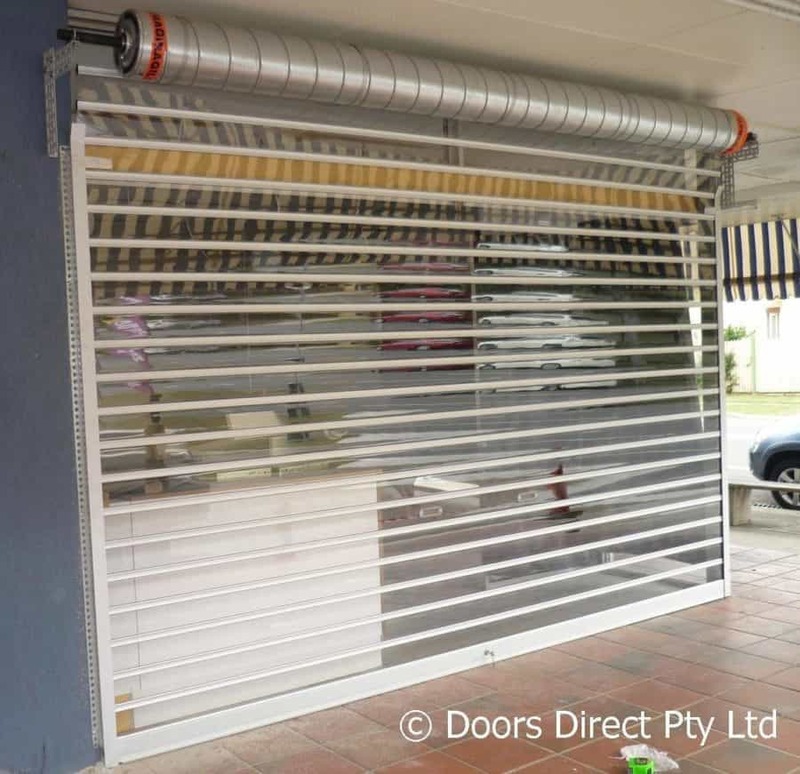 Roller Shutter Doors – Roller shutter doors not only look fantastic and add to your building’s security but are also safe to operate. Our roller shutter doors are made to the highest safety standards with quality materials. Basement Car Park Doors – Even basement car parks are no problem for installing roller doors in. They will keep employees and guests’ vehicles safe and can be operated with a key, code or sensors that open the doors automatically when they detect a car. Creating New Openings – Think a new entryway is necessary for your building? We’re experts in being able to identify safe points of entry to create new openings and adding roller doors to them. Motorising Existing Chain Operated Roller Shutters – If you’re looking for a bit of convenience, let us change those chain operated roller shutters to an automatic system with a motor. We’ll help you find the right one depending on your size of shutters. Doors Direct proudly supply & install a wide range of Grifco products, from light commercial roller door motors to heavy duty 3 phase roller shutter motors. Grifco are the largest manufacturer of commercial garage door openers in Australia. They are industry leaders thanks to their innovative products that allow for quick and quiet operation of heavy duty garage doors. For over 50 years, Grifco have been creating products that contribute to safe work environments, which is why they are trusted for handling industrial and commercial doors. We can upgrade existing industrial motors to allow for any application from remote use to more secure key switches. Enquire today for a great price on the Grifco range. Running a business can be hard work, and we want to make sure you protect it and all its assets the best way possible. Roller shutters are a cost-effective way of doing that, and Doors Direct can help. We will find the perfect solution for your roller door needs, keeping your goals and budget in mind. Give our team a call to discuss your options. We can provide a free, no-obligation quote. If you need some inspiration, take a look at our Gallery to see the great work we have done around Brisbane already.